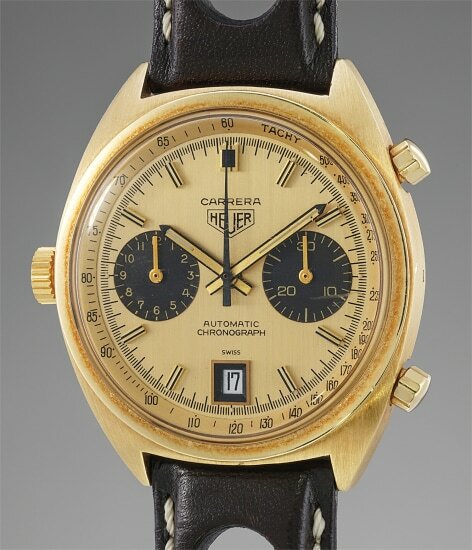 Reference 1158CHN is known amongst collectors as the “Ferrari Carrera”. The watch was made famous in the 1970s by the many Grand Prix drivers such as Niki Lauda, Clay Regazzoni or Mario Andretti to name but a few, who were spotted wearing it on the racetrack. As part of the sponsorship he concluded with Ferrari, Jack Heuer himself was gifting this reference to drivers and brand ambassadors such as Jo Siffert or Ronnie Peterson. The present watch is a particularly nice and well preserved example. Powered by the automatic caliber 12, the crown has been moved from the right to the left of the case as it is used only to set the time. This particularity would allow a more comfortable wear and differentiated the manual winding watches from the automatic ones. It features two black subdials that are nicely completed with a silver date. At the time, reference 1158CHN was available with either a black or silver date. By combining Heuer's strong sporty DNA with a dressy and elegant 18K yellow gold case, this watch embodies the glamorous era of the race track in the 1970s. This iconic chronograph manufacturer has a long tradition of precision timekeeping. As early as 1882, founder Edouard Heuer held a patent for a chronograph watch; in 1887, he received a patent for an oscillating pinion, which is still in use today. These specialized timepieces have been at the heart of the firm's success, enabling the brand to be chosen as early timekeepers for the Olympics. In 1969, the company introduced their first automatic chronograph watch, the Monaco Heuer, which celebrated the Monaco Grand Prix. Other key chronograph models include the Autavia and the Carrera, all of which having become iconic models of the firm. Model: Cosmograph Daytona "A Series"
Ref. 18208, case back stamped to the inside "18200"
Model: RM016 "The Hour Glass"
Model: Cosmograph Daytona "Jumbo Logo"
The only known and attractive platinum perpetual calendar wristwatch with original certificate, retailed by Tiffany & Co.
Model: "Grande and Petite Sonnerie"
Model: Cosmograph Daytona " Telephone Big Red"
Model: Cosmograph Daytona Paul Newman "John Player Special"
Model: "The Guido Mondani Killy"
Model: Lange 1 Tourbillon "Homage to F.A. Lange"
Model: De Ville "Tiffany & Co." and "Constellation"
Model: Cosmograph "Fuerza Aérea del Perú"
Model: Cosmograph Daytona "Big Red"
A limited edition stainless steel and ceramic chronograph wristwatch made for the "Association Suisse de Football"
Model: Day-Date "Woman in Red"
Model: Cosmograph Daytona "Paul Newman"
Model: Cosmograph Daytona Paul Newman "Oyster Sotto" a.k.a. "RCO"
An impressive and attractive 14K yellow gold chronograph wristwatch with bracelet, retailed by Tiffany & Co.
Ref. 1655, inside case back stamped "1655" and "II.72"
Model: "Patent Pending" Sea-Dweller "Double Red"
Model: "Abstract in blue, grey and red"
Model: Daytona "Paul Newman - Musketeer dial"